Sail. Alfie loves to sail. He first took it up when he lived in Australia, and when he moved here he bought a sailboat and raced it on weekends. He likes to joke that he sold his boat to make way for his kids, but he still takes us out on the lake for a sail now and then. Run. Running and walking are my favorite forms of exercise. It doesn't cost anything, it's great for muscles and bones, and the natural high I get when I run is better than any form of drugs or alcohol! California is the ideal place to run outdoors because the weather is great almost all year. Play soccer. Everyone in the family loves soccer, but while The Pea and I are content to sit on the sofa and scream at the tv, 3Po and Jammy love getting out and kicking a ball around! They practice 3 times a week with their soccer club, compete in matches and tournaments during the weekend, and play in the park with their dad. Since Alfie and The Pea are so fair, sun safety is extremely important, and applying lotion every day is a non-negotiable. 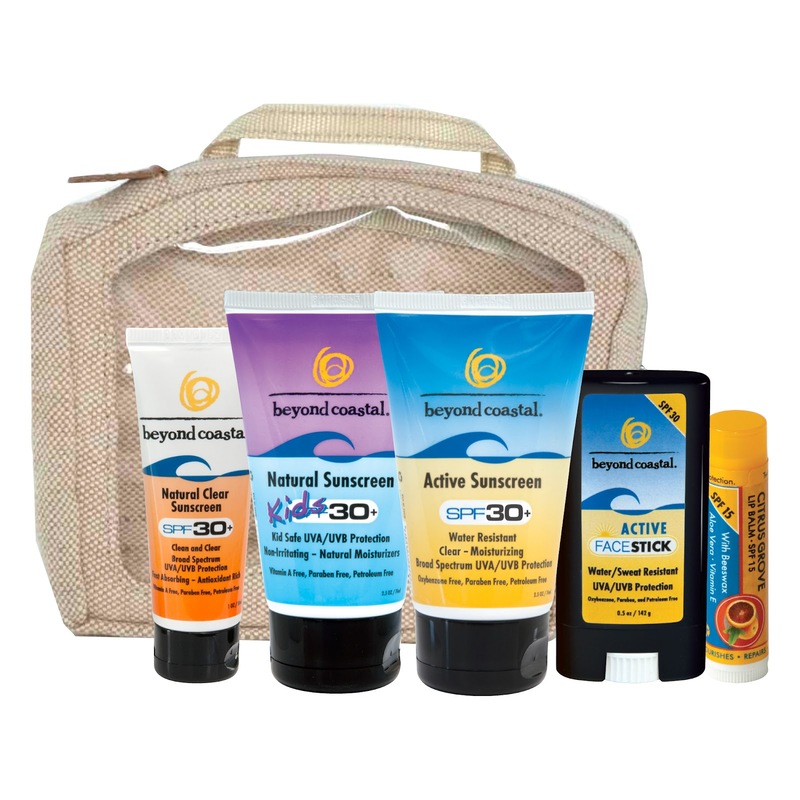 I'm always on the lookout for effective, safe and convenient suncare products, so when I was invited to review Beyond Coastal's line of natural, family-friendly products, I readily agreed. These products rub onto the skin easily and smell great! My favorite is the Active Facestick, because it lets my apply sunscreen on everyone's faces without getting my hands all greasy, and has a nice lemony scent. It's especially nice to know that Beyond Coastal uses natural ingredients like aloe vera, shea butter, coconut oil, jojoba oil and more to keep our skin hydrated and nourished -- the last thing I want is to be slathering chemicals on my kids every single day! Leave a comment on this post and tell me your family's favorite fun in the sun activity. This entry must be completed before any extra entries will count. 2) Blog about this giveaway, making sure you include a link to the giveaway (http://bit.ly/IFf8a9) in your blog post (1 entry). 3) Like Bonggamom Finds on Facebook (1 entry). This giveaway ends at 11:59PM PST on May 17, 2012; I will draw a winner at random on May 18 and post his/her name after she/he confirms acceptance. Continental US residents only. For additional giveaway rules, click here. Good luck! Disclosure:This is a compensated post from Beyond Coastal, via Resourceful Mommy Media. The views and opinions expressed here are my own. Our favorite is swimming in the pool at the campground. Thanks. We love to go on our jet ski! We love hiking in the Rockies. I follow you on Twitter as hybroanglid. I entered the Dole Fruit Bites giveaway! I entered the Dale & Thomas giveaway! I entered the Timeless Family Classics giveaway! I entered the Energizer giveaway! We love camping and swimming, and when that's not available, just a simple picnic in the grass is good too! I entered the Dale and Thomas giveaway! I entered the Nudo giveaway! I entered the Cheerios giveaway! I just entered the Donut Day giveaway! our favorite family fun time is BBQs and water fights. the kids have a blast and the adults get to relax =) 00ps, forgot my email? We love having picnics in Central Park. I follow @bonggafinds on Twitter . We love to play frisbee! I entered the Billion Dollar Brow giveaway! I entered the Marvel giveaway! Congratulations to the winner: #14, justicecw! I'm a Toyota TWIN Member! New free American Girl learning activities! Watch the latest Joico Haircare Webisode!